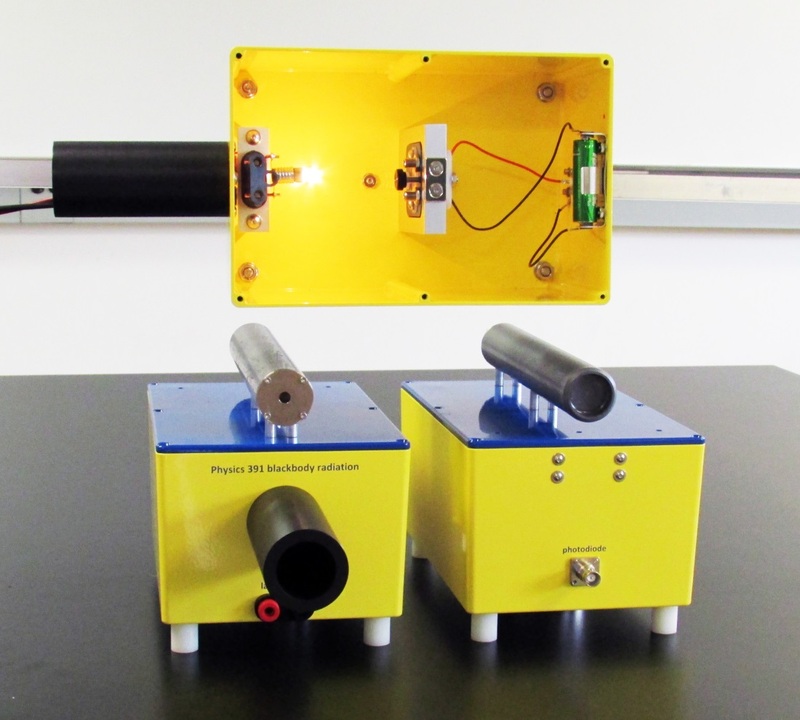 In January 2015, we at the University of Michigan began the process of creating an entirely new undergraduate physics lab to complement our junior?level lecture course in modern physics, a staple of essentially all physics programs at every institution. The rationale for this new offering is described below. In the past 100 years, the development of quantum mechanics has revolutionized our understanding of Nature on scales that range from the sub?atomic to the vastness of the Universe. Thus, the lecture course, Introduction to Modern Physics, is the essential course for undergraduates who have a serious interest in physics as a major and a possible future career, introducing both quantum mechanics as well as its consequences for atomic, solid state, nuclear and particle physics. The concepts of quantum mechanics are quite counterintuitive and even today some of the ideas of indeterminism that Einstein found so distasteful are still debated. Bringing a real concrete experience of this field to every student is the focus of the task I began approximately two years ago. This new course, identified as Physics 391, closely complements the parallel lecture course and includes demonstrations of the quantization of light, the wave nature of matter and the atomic spectroscopy that led Bohr to the insights that underlie the foundations of modern physics and its technological consequences. There is a strategic element of this project that complements the intellectual goals. We are in the middle of a period when the costs of an undergraduate education are becoming formidable obstacles to those students whose parents are less fortunate financially. Online courses (MOOCs) offer substantially similar educational benefits as university lecture courses for a fraction of the cost. If bricks?and?mortar institutions such as the University of Michigan are going to thrive in the decades ahead, they will have to depend on providing intellectual opportunities that cannot be transmitted down a fiber optic cable. We hope that our new lab course will serve as a model for integrating theoretical concepts with hands?on experiences that will greatly enlarge the depth of understanding of how the Universe actually functions. 1. Blackbody Radiation: The Stefan?Boltzmann Law and the Planck spectral distribution are studied by measuring the power dissipated by an incandescent lamp and the illumination through several narrow band filters. 2. Photoelectric Effect: The maximum energies of electrons ejected from the photocathode of a photocell are determined for illumination by three different laser pointers and the Planck Constant is estimated from the hypothesis of a linear relation between photon frequency and energy. 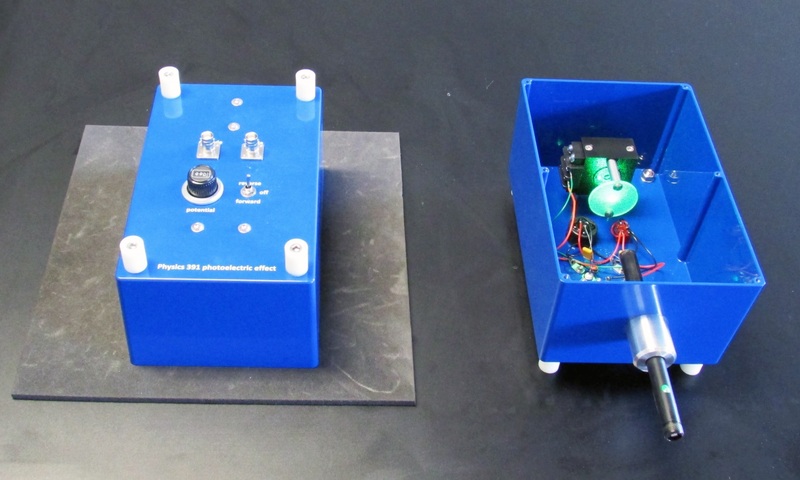 The photoelectric effect apparatus from top and bottom. Lasers with three different wavelengths are used to illuminate a vacuum photodiode. A potentiometer provides the ability to control the reverse bias voltage to determine the point when photocurrent ceases. 3. Interference & Diffraction: Since interference and diffraction are critical to understanding many quantum mechanical phenomena, these effects are demonstrated with laser pointers of different wavelengths and a variety of targets ranging from single slits and wires through multiline diffraction gratings. Newton’s Rings provide a window to use interference to determine the curvature of long focal length lens and a Michelson Interferometer is used to measure the thickness of a microscope cover glass. Apparatus for observing diffraction & interference patterns. 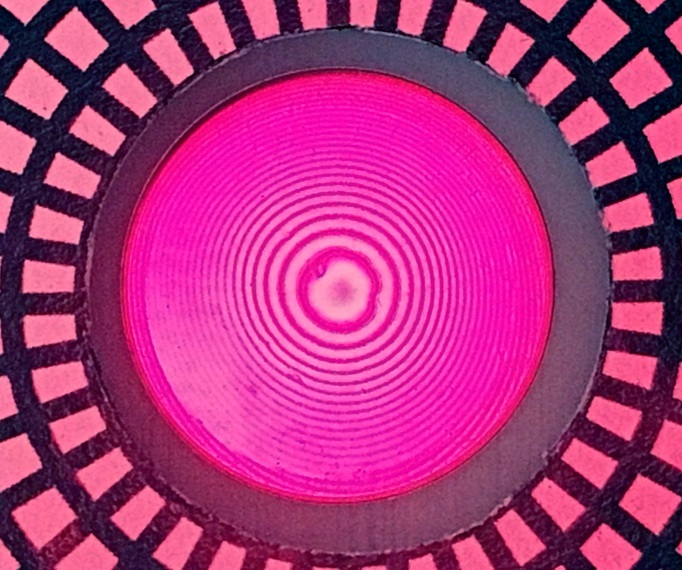 For this image, the target is a 10 micron slit simultaneously illuminated by red, green and violet laser pointers. 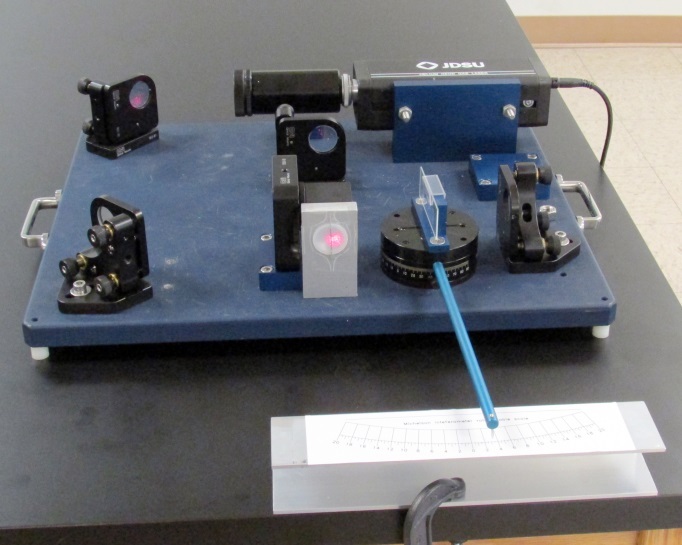 Michelson interferometer with rotating sample stage. A thin rod extends forward for tracing the correlation between optical path length and the interference pattern location. Photograph of the Newton’s rings optical target. The image has been somewhat Photoshopped to enhance the contrast. Photo obtained by Jennifer Ogilvie with an iPhone 6s. 4. 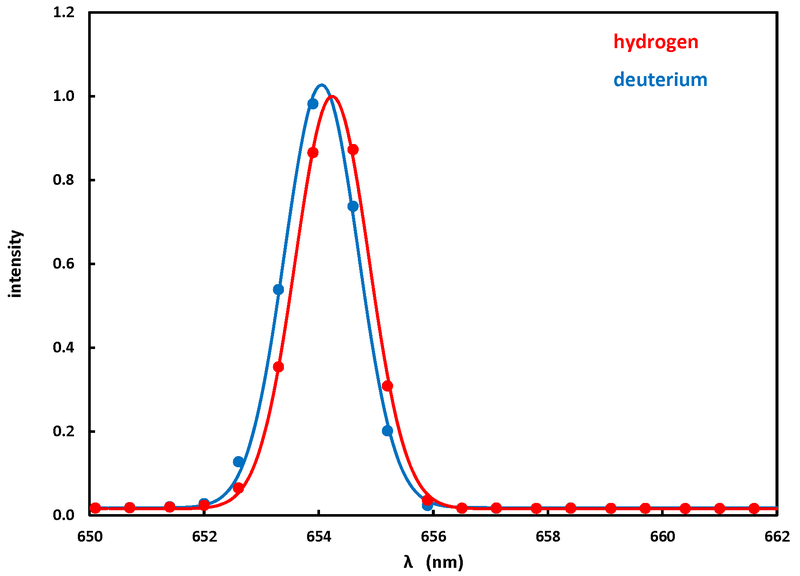 Spectroscopy of Hydrogen and Deuterium: The emission spectra of hydrogen and deuterium are used to explore the basic elements of atomic structure. The first six lines of the Balmer series are measured for hydrogen and used to determine the value of the Rydberg Constant. By carefully analyzing the spectral waveforms, a small shift for the Hα line between hydrogen and deuterium is used to see the effect due to finite nuclear mass and thus obtain an estimate for the electron/proton mass ratio. 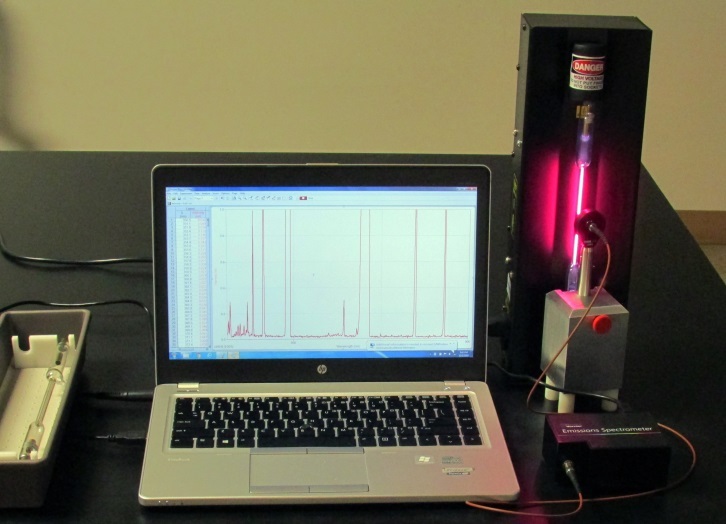 Atomic spectroscopy apparatus with a hydrogen light source. The display shows the first six lines of the Balmer series. Click on photo for a higher resolution view. Hα lines for hydrogen and deuterium. The small spectral shift is due to the difference of nuclear masses between H and D and permits an estimate of the electron-proton mass ratio. Click on photo for a higher resolution view. 5. Hall Effect: The Hall Effect gives students an opportunity to become better acquainted with the electrical conduction properties of semiconductors, the basic principles of which govern the technologies upon which our modern world depends. The Hall Effect of p?doped germanium sample is measured in a magnetic field of 1 Tesla (10 Kilogauss) as a function of current and temperature to determine the nature of the majority carrier and the band gap potential. 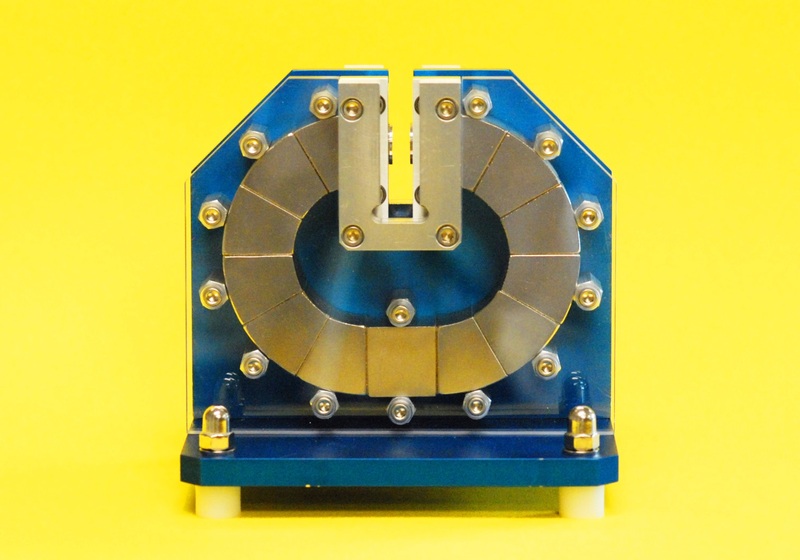 The permanent magnet ring for providing test fields for the Hall effect. 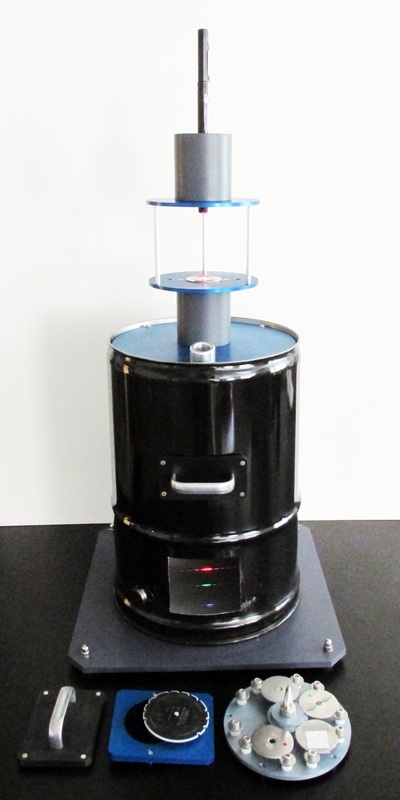 The magnetic field in the ¼″ gap at the top is 1 Tesla (10 kGauss). Click on photo for a higher resolution view. For the Immersion program, one day will be allocated for each experiment. Typically each experiment takes about 2 ½ hours to execute followed by 2 hours or so for data analysis. Participants are urged to work in pairs. Although we have enough setups to accommodate 16 people, we would like to limit this workshop to a maximum of 8. For anyone who is interested in this program, we will be glad to send you copies of the lab manuals that we provide for our students.